For more than six years monetary policy has been “unconventional”; meaning that interest rates have not been available to do the work. Over the ages, monetary policy has become synonymous with interest rate policy. If, for example, the interest rate goes down/is low/or even zero, monetary policy is deemed easy/expansionary/accommodative, and vice-versa. The tight association of monetary policy with movements and levels of interest rates is not only stupid but has for long been discredited by many, including such high profile “outsiders” as Ben Bernanke and Frederick Mishkin. Why does this misconception endure? One possibility is that it has become ingrained. More recently, textbooks, which tend to lag “practice”, have elevated the interest rate to the category of “the” monetary policy instrument. An ironic example is given by Mishkin´s Macroeconomic Theory and Practice textbook. For over six years, the federal funds rate has, effectively, been zero. However, it is widely expected that the rate will lift off before the end of this year, as the normalization of monetary policy gets underway. The approach of liftoff reflects the significant progress we have made toward our objectives of maximum employment and price stability. The extraordinary monetary policy accommodation that the Federal Reserve has undertaken in response to the crisis has contributed importantly to the economic recovery, though the recovery has taken longer than we expected. The unemployment rate, at 5.5 percent in February, is nearing estimates of its natural rate, and we expect that inflation will gradually rise toward the Fed’s target of 2 percent. Beginning the normalization of policy will be a significant step toward the restoration of the economy’s normal dynamics, allowing monetary policy to respond to shocks without recourse to unconventional tools. Translation: Lift rates now so you can lower them when the need arises! 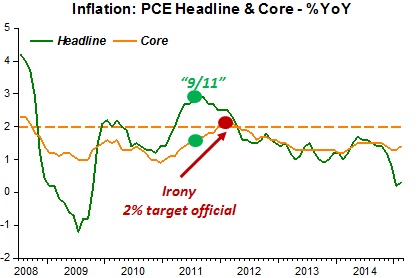 The fact that inflation has remained well below “target”, for most of the last six years is bothersome to the Fed, because it “constrains” their desire to quickly become “conventional”. …that inflation is currently depressed by the fall in oil prices and other one-time factors the Fed regards as “transitory.” As a result, she said that she might favor raising rates ahead of any indications that prices excluding the energy market started picking up significantly. 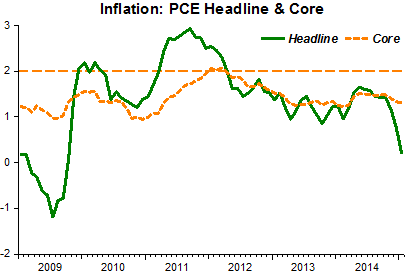 Otherwise, she said, the Fed would risk significantly overshooting its inflation target. Note the subtlety. Inflation has not been depressed for more than six years, only currently, and that´s transitory; and if we delay raising rates we risk significantly overshooting the target. The fact that the target has been undershot for six years is conveniently “erased”! 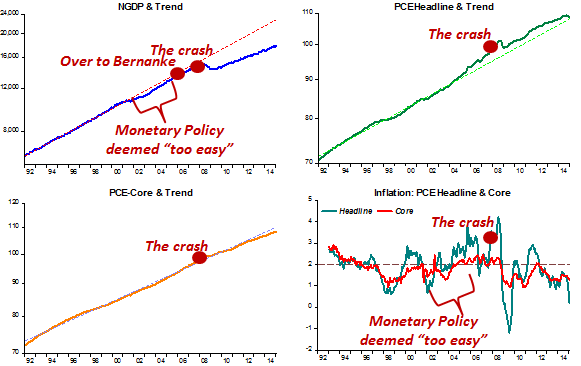 If they only recognized that the target has been missed from below for most of the time during the past six years, they would have to conclude that monetary policy has not been easy or highly accommodative, as they like to say, but in fact unduly tight. That would bother them no end! It seems Esther George (EG) and Loretta Mester (LM) are stand-ins for the departed Fisher and Plosser! Since they can´t play the role of “Inspector Clouseau”, let´s call them “Maggies in Drag”. Most times in life, moving from extraordinary to ordinary is considered a bad thing. In the case of monetary policy, such a move should be viewed as a good thing – because it means conditions are in place for a sustainable economic expansion with maximum employment and price stability. 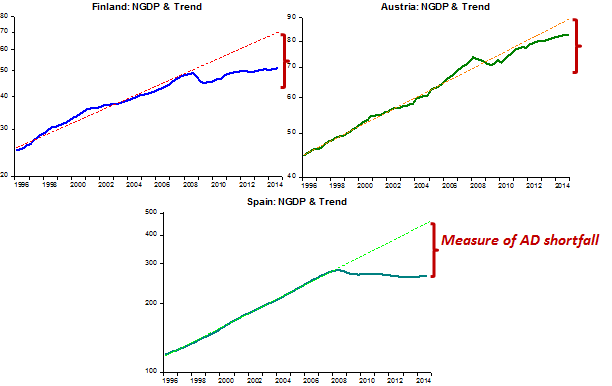 The underlying economy has been “quite weak by historical standards” and thus in need of low interest rates to sustain progress on unemployment; inflation remains very low; the risk that because of a stagnant global economy, the U.S. might not be able to bear very high interest rates in the future; the experiences of other countries with early rate increases, such as Japan and Sweden, point to caution; it pays for the Fed to take out “insurance” against a return to exceptionally low inflation and high unemployment by making sure with sustained low rates that the economy gets on a stronger track. 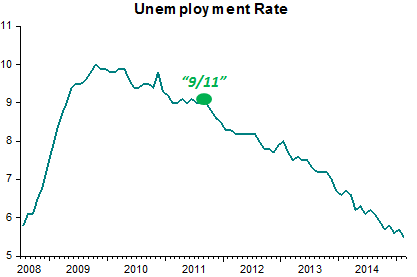 The chart shows important Yellen concerns. 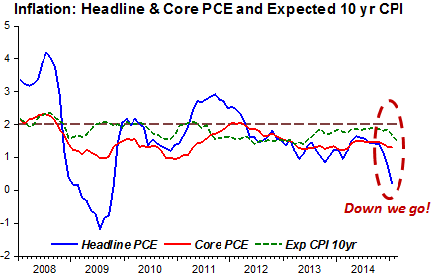 Core inflation and expected long-term inflation have mostly stayed well below target for the past seven years. Even the volatile headline measure has underperformed! 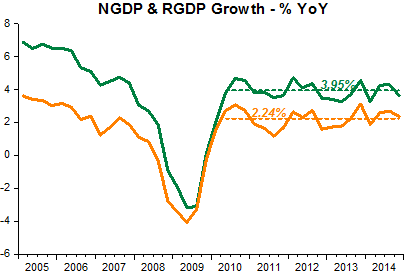 For the past five years, after “emerging” from the “Great Recession”, the economy has yet to find a “stronger track”.